The UFC 146 card is complete and gone but it has provided us with a very good blueprint on what to expect going forward with future matchups. Some of the matchups are a no brainer with others having many options available due to still being very much a prospect or simply being nowhere near the top of the division. Let’s get right in to it. The no brainer is that Junior dos Santos will probably face Cain Velasquez again. Some people will say it’s too soon, but there isn’t really another fight out there for JDS as this time. Plus, there were so many factors going into the first fight, plus it ended so fast that I’m not sure that it’s a true indication of just how good either fighter is when compared with the other. Frank Mir-He’s in a difficult spot in that he’ll probably never challenge for the title again. He’s still a very good fighter that can beat a lot of heavyweights out there. Do you make him a gatekeeper at this point? He just turned 33 years old so it’s probably time to start challenging him with young up and comer’s. It might be too big of a jump at this time, but I think Stipe Miocic has the skill set that could give Mir problems. It would be smart to use Mir to build Miocic up as a legitimate contender. Antonio Silva-He’s in a tough spot after dropping two straight fights, but there’s no shame in losing to Velasquez and Daniel Cormier. He’s still relatively young so a fight with someone like Brendan Schaub makes all types of sense. Both have lost two straight fights and both have fought recently so it should work logistically. The loser of this one probably gets released. Roy Nelson-We didn’t really learn anything from Nelson’s fight on Saturday night in that we already knew that right hand could put a lot of heavyweights away. He keeps himself in the thick of things with the win. It’s doubtful that he’ll ever be a real contender in the division with losses to Mir and JDS. A fight with Mark Hunt would be a great fight when Hunt recovers from his injury that kept him from competing at UFC 146. Stefan Struve-Wow. This kid has all of these UFC fights and is still only 24 years old. He actually fought smart this go round with Lavar Johnson didn’t take any unnecessary damage for once. There aren’t any fights that really make sense for him at this point unless he rematches someone. It is possible that you could put Stipe Miocic in against him, but I don’t like that fight for some reason. Ben Rothwell (if he beats Travis Browne at UFC on FOX 4) is the only name that I like at this time. Sidenote: Browne has a KO win over Struve. Shane del Rosario-Matt Mitrione (if he defeats Rob Broughton at UFC on FOX 4). Jamie Varner–Evan Dunham, since that’s who Varner replaced to get the win over Edson Barboza. 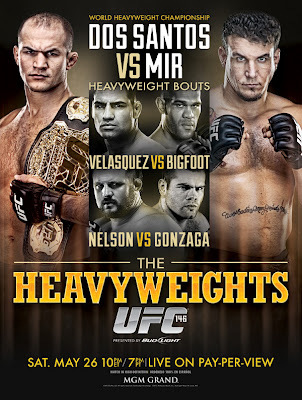 Dan Hardy-Since Hardy likes to strike….the winner of Thiago Alves vs. Siyar Bahadurzada at UFC 149. Otherwise, I could just say someone like Charlie Brenneman and give him a loss :). Glover Teixeira-Get this man a legitimate fighter in a hurry. Stanislav Nedkov is undefeated and knocked out Luiz Cane at UFC 134.